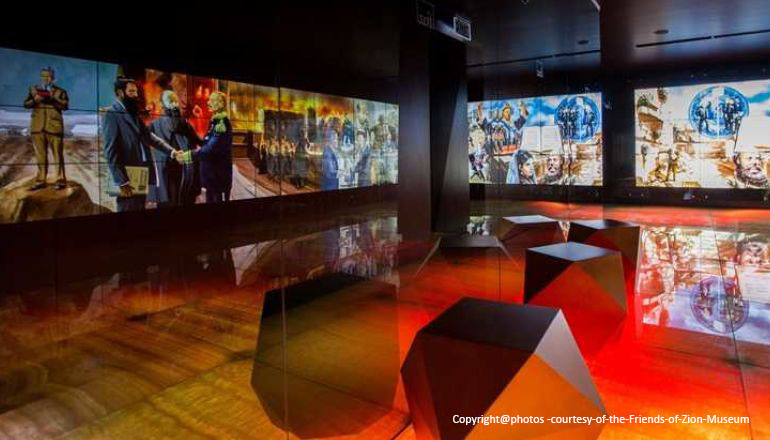 The Zion's friends Museum is a new museum that opened its gates in 2015 and is located in the heart of Jerusalem city center. The museum presents another layer in the Zionist story and brings the heroic stories of the non-Jewish friends of Israel that stood by the Jewish people and supported Zionism throughout history. The story is told by jumping between different time periods, where in each one of them are presented different characters that stood by the Jewish nation and helped each in their own way to establish a Jewish state. A tour at the museum is a unique multisensory interactive experience, found nowhere else in the nation. The museum presents seven exhibits that combine 3D technology, touch screens and more while combining unique and advanced elements, Accompanied by a moving original musical score that was developed especially for the museum. To this day, the museum has hosted hundreds of thousands of visitors that all had an amazing and special experience. The museum tour takes one hour and is accompanied by a museum guide. Tours leave every 15 minutes in groups of up to 25 people. The museum offers its tour in 16 different languages (including Hebrew, English, Arabic, Russian, Ukrainian, Spanish, Portuguese, Dutch, Hindu, Indonesian, Korean, Mandarin, Italian, French, Polish and German). We also offer a gift shop and a coffee shop that are located in a historic building. Sunday – Thursday 9:30 Am – 8:45 PM. Friday: 9:30 AM -2:00 PM. Saturday 10:00 AM – 6 PM. 20 Yosef Rivlin Street Nahalat Shiv'a', Jerusalem 942401.